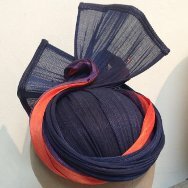 Our popular and very versatile Abacadabra headpiece can be made using Jinsin, silk abaca or Paris Cloth. It is easy to make and has great potential for furthering the design. 25cm of Jinsin, silk abaca or Paris Cloth. 2 metres of paper covered wire, not too firm. Approximately 1 metre of edging to match or complement the abaca. All the tools you will need: dolly heads, wire cutters, pliers, sewing needles, thread, scissors, sewing machines, blocks, etc. Any of the workshop materials will be available for purchase should you need them. Let us know in advance if possible. Abacadabra - make it in Jinsin, silk abaca or Paris Cloth.